I'm going to buy Multiecuscan. I would understand if it was possible to encode a new remote control and trasnponder of a Fiat Grande Punto 2006. According to MES screens for Grande Punto then it looks like it can program keys AND remotes that are RFI based. I suggest/ask the above as there are different versions of the Grande Punto each with potentially different body computers and I have NOT checked all possible combinations for key programming support. The function is supported (Key programming). 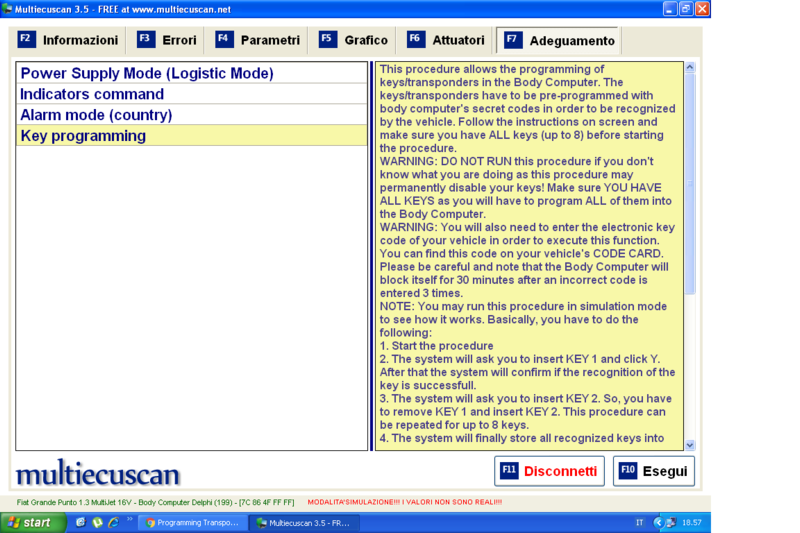 In the description is written: "The keys/transponders have to be pre-programmed with body computer's secret codes in order to be recognized by the vehicle." If you purchase a new key, virgin, I can program it entirely? I have the secret code for programming keys. I have tried a new key/remote with MES 4.0 Registered on my Ducato X250 2.3 Facelift ans it is nor recognized. The original key is well recognized. The vendor of the key says that the key needs to be pre-coded, but I was thinking that MES was doing it (with the electronic code). May we have an answer please ? Thanks ! Did you manage to sort it? How do you pre-code a band new key transponder? I try to rpogram the PLCC version of the PIC16F877A with a PLCC to DIP programmer with the melab U2 programmer but it report the device dose not match the selected device,but I can program the DIP version of the same chip,can anybody help me with this issue? You need the dump of the body controller and a key programmer device, like zed-bull to prepare an id48 chip, so you can program it to.the car with multiecuscan. Hi lads, I know its a long shot, but I have to ask. Im looking for remote control for Xindak XA3250 tube preamp. I did try the factory in China, but no response from there. Any help and suggestions are more than welcome.